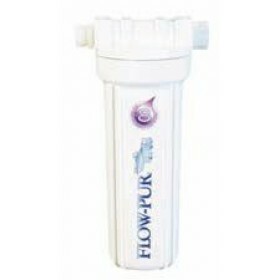 Replacement GAC/KDF filter cartridge for Flow-Pur ultimate system. Filter is long lasting, inhibit bacteria growth, reduces chlorine, taste, odor, and VOCs. Cartridge interchanges with other brand #5 cartridges. Flow rate 2.5 GPM. "Just what I wanted, at a good price." "The product was as advertised, the service was outstanding and the shipping was prompt. A great..."
""Excellent service, prices & fast shipping. Will shop here again.""